I’m not a big name blogger, I’m a little name blogger. I have a few blog followers and a few friends on Facebook… Twitter is seriously low on the totem pole of life’s values for me, but I will tweet on occasion. And even with such a low potential impact on the world, it’s so easy for me to get caught up in the need to be saying something. Lately, I’ve been intentionally sharing some pages from my prayer journal on Facebook. It’s been fun and stretching for me to articulate the ideas I’m praying about in a way that invites other to share the journey. Yesterday I’m wrapping up some travel to officiate a friend’s wedding, and sitting at Starbucks on the morning of my evening return flight, trying to get through my morning prayers, thinking about how I’m going to burn some time, and wondering what deep insight I can drop on Facebook. Been there? Have you ever been there and been dry as an old bone in the Saharan midday? I can’t imagine how this weighs on the big name bloggers, the ones who need those clicks to keep the search engines buzzing and the advertisers paying. But yesterday, I remembered that it’s ok to be dry sometimes. It’s ok to have nothing to share. Sometimes, we just are. We aren’t funny, aren’t insightful, aren’t pithy, aren’t edgy, aren’t original, aren’t cool… we just are. And being is good enough. Jesus called it abiding. He asked us to abide in his love. (John 15) He didn’t say that we should out perform our achievements of the previous day. He didn’t say that we should manage to have a certain quota of Likes or the coveted Shares on Facebook, Twitter or Instagram. Those things are cool, and they still give me a charge when I get them, but thank God that I have an abiding love to sustain me and am not dependent on the fickle hit or miss of social media affections. Thank God that you have an abiding love, too. Social media is a tool, a vehicle for connecting to people. It’s a way we communicate. I like social media. But at the end (or beginning) of the day, there’s always a deep well of peace to be found, however your pressures in life may manifest. So take some time and just be. 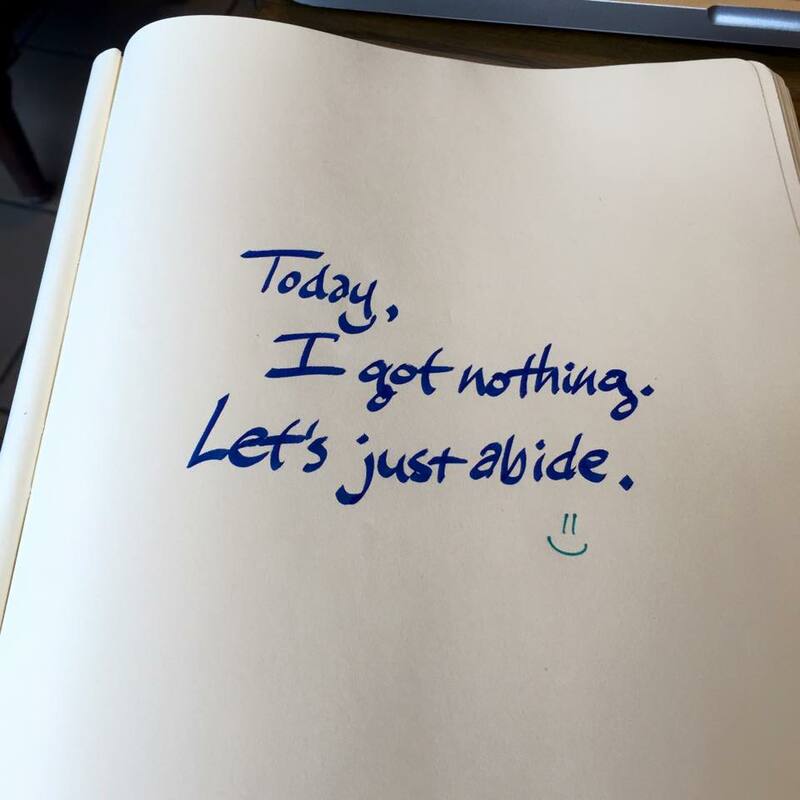 I may not see you abiding, so I probably won’t have a chance to Like it. I won’t see you sitting and soaking up some God-love, but how cool is it that we do still Share it? This entry was posted in Devotional Thoughts, Just Life.